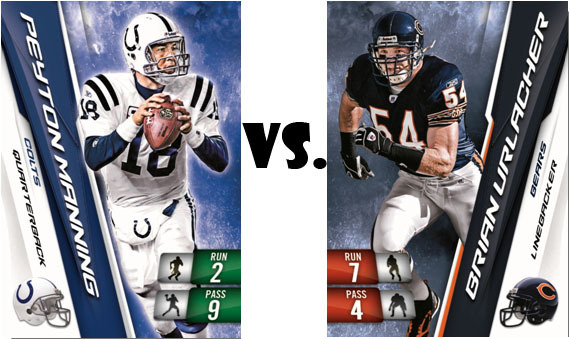 NFL Adrenalyn is the all-new trading card game developed to introduce fans to the hobby of card collecting. This easy-to-learn card game captures the all the fast-paced excitement of the National Football League and puts you in control. Build your ultimate fantasy team and dominate your opponents with stars like Peyton Manning, Drew Brees, Tim Tebow, Adrian Peterson. Play Online - Every card features an Activation Code. Enter your codes online to build your virtual collection, play against your friends and win exclusive prizes! 14 Players from each NFL Team! Editorial Note: After playing past versions of Topps' Attax and Panini's Adrenalyn, I would say that the strategy of Adrenalyn is little bit more stimulating and challenging. Panini's recent track record with products for kids, including their successful sticker series would suggest that they are serious about providing kid friendly products that capture the immagination. With a price point so cheap, I would highly recommend that kids give it a try. Yeah, I think it’s weird how Strat-o-Matic Baseball is the forefather of Magic & Yu-Gi-Oh and yet sports cards are getting beat by them. I still love to play Strat-O-Matic on occasion despite the fact that the players are from decades ago. I am a user. IT ROCKS! changed rating. man I just got on today and it is awesome! I created a new deck and i traded w/ someone! I will be in the top 10 some time! Username is Tyler1821510. I love it!